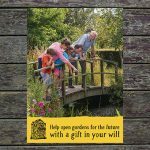 Thank you so much for your interest in leaving a gift in your will to the National Garden Scheme. We could not do what we do without the generosity of our garden owners, volunteers, visitors and supporters. How do you feel about leaving a gift in your will?